You may have seen them TV shows, on the big screen or read about them in horror novels, but pretty soon poltergeists, criminal masterminds and zombies will begin roaming our streets. There is no need to be afraid. We’ll also have pint-sized superheroes, cowboys and astronauts coming to our defense. No matter which doomsday scenario occurs near your restaurant, store or production facility, we at Safe Food Training have developed a ServSafe MN plan to help you prevent your Halloween event from becoming a food-borne illness horror story. If your outlet is open the evening of Halloween, you’ll need to be prepared with a treat for young goblins. This is not only a great way to be a part of your community’s festivities, but parents will see your hospitality and may return to sample your cuisine on a later date. We have three things to keep in mind when you plan the treats you’ll have available. You will have many unwashed hands diving into your goodie bowl over the course of the evening. Providing only wrapped candies will reduce the chances that any illness will be spread from one small zombie to the next. Even if you’re serving treats prepared on site, make sure that they are packaged as if they were for sale. Your visitors will only be in your shop for a few seconds, many simply wanting to get a larger haul than the rest of their trick-or-treating buddies. Packaging your treats will keep them safe and allow them to fall into their sacks without creating a gooey, fun-threatening blob. Always remember that your stop may not be your visitors last stop on their trick-or-treat adventure, so make sure that you only offer items that do not need refrigeration. If you dress up while on the clock, remember to make sure that your costume doesn’t get in the way of food safety. Keep it simple and avoid jewelry, loose clothing with parts than can fall off and only wear disposable food-service gloves when handling treats for your guests. 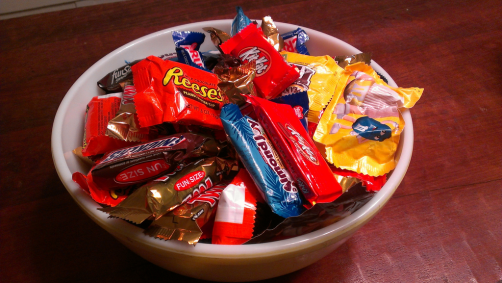 We’d like to know your business’ strategy for dealing with trick-or-treaters? Are you simply in it to have fun and dole out candy to smiling mutants, or do you view this as an opportunity to market what your restaurant, bakery or shop can do?